Includes superior class hotels with private bath, breakfast and dinner daily, travel documents, group airport transfers in Europe. FEATURING In Paris Notre Dame Cathedral, the ancient Severin quarter on the Left Bank, the Louvre Museum with Mona Lisa by da Vinci, the elegant Champs Elysee Boulevard and the Arc de Triomph, the Bohemian artists’ quarter of Montmartre with the gleaming Sacre Coeur Cathedral and of course the Eiffel Tower. 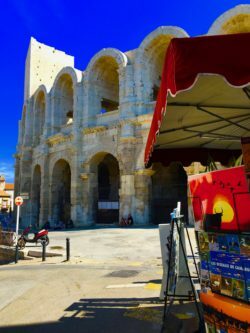 In Provence the 700 year old Papal Palace and St. Benezet Bridge in Avignon; Van Gogh countryside, the town of Arles with the ancient Roman Amphitheater….and the bullet train TGV from Paris to Avignon. Participants should enjoy walking as many sights are available only to pedestrians. ADD 3 DAYS IN LONDON BEFORE THIS TOUR FOR AND SAVE. This is a LEISURE TOUR from ONE hotel. Unpack only once and ENJOY! Take time to savor the culture you are in, spend a quiet afternoon in a sidewalk cafe, visit a bustling market, explore neighborhoods and museums of your choice, browse boutiques and tiny shops and enjoy the atmosphere of European living. All LEISURE TOURS will include airport transfers at the destination, very good to excellent hotels with private bath in a central location, breakfast and dinner daily, ETCS Travel Preparation and Sightseeing Documents, and myself as guide/translator. June 24. We will explore the heart of Paris, the Ile de la Cita and Ile St. Louis and visit the stupendous NOTRE DAME CATHEDRAL. Later we stroll the ancient cobblestone streets of old Paris, the Severin quarter. Overnight Paris. June 25.Today we visit the Louvre Museum, famous for da Vinci’s Mona Lisa and the beautiful Greek Winged Victory statue. 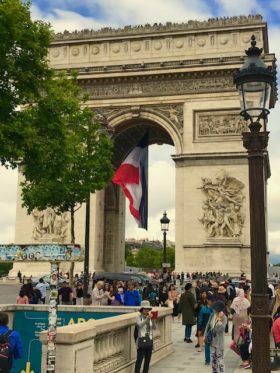 In the afternoon we will explore the most famous avenue in the world, the Champs Elysee and see the Arc de Triomph and the Tomb of the Unknown Soldier. You may wish to spend this afternoon at the Pompidou Museum for modern art or the Musee d’Orsay for its impressionist masterpieces. Overnight Paris. June 26. The morning begins with a stroll through the Bohemian artists’ quarter of Montmartre, former home of greats such as Picasso and Utrillo. 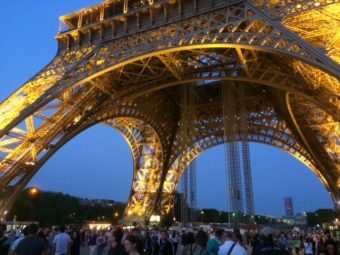 In the afternoon we view the Eiffel Tower, built for the 1889 World’s Fair, the tallest structure in the world at the time. Shop the Left Bank this afternoon or find a quiet cafe to enjoy watching the street scene. Overnight Paris. June 27.The bullet train TGV whisks us at 200 mph to Avignon, unofficial capital of Provence and the Papal seat in the 1300s. Overnight Avignon. June 28. A visit to the 700 year old Papal Palace begins the day. Later we will cross the Rhone half way on the St. Benezet Bridge, an enormous stone structure one third destroyed in the 1600s. Overnight Avignon. June 29. 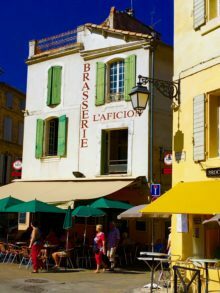 A train through the Provence countryside and lavender fields brings us to the charming village of Arles. Famous for its awesome Roman Arena and St. Trophime Church, it was also home to Van Gogh while he created some of his most famous paintings. Overnight Avignon. June 30. This morning join me on a tour of the Medieval Wall, Eglise Saint Pierre, and the Parc des Rochers des Doms with its spectacular view of the Rhone River Valley. OR join an optional full day to explore the entire Provence area with visits to Les Baux, Gordes, Roussillon and the Pont du Gard from Roman times. Overnight Avignon. July 1. Return flight to the USA. LAND PRICE per person sharing a room: $3938 per person sharing, $3738 with early deposit, for MIKE ROSS TRAVEL returning travelers only $3438. Single supplement $599. AIRFARE AND TAXES EXTRA. LONDON ADDITION only $1199 per person sharing a double room. PAYMENTS: $1500 p/p deposit with REGISTRATION FORM on website. Make check payable to ETCS, Inc., 922 Oak Grover Road, Jackson MI 49203. Balance due 98 days prior to departure. See TERMS & CONDITIONS on the web site. Call Mike at 517-782-6847, toll free 877-845-4763, send an e-mail to Mike@mikerosstravel.com or visit us on the web at www.mikerosstravel.com.